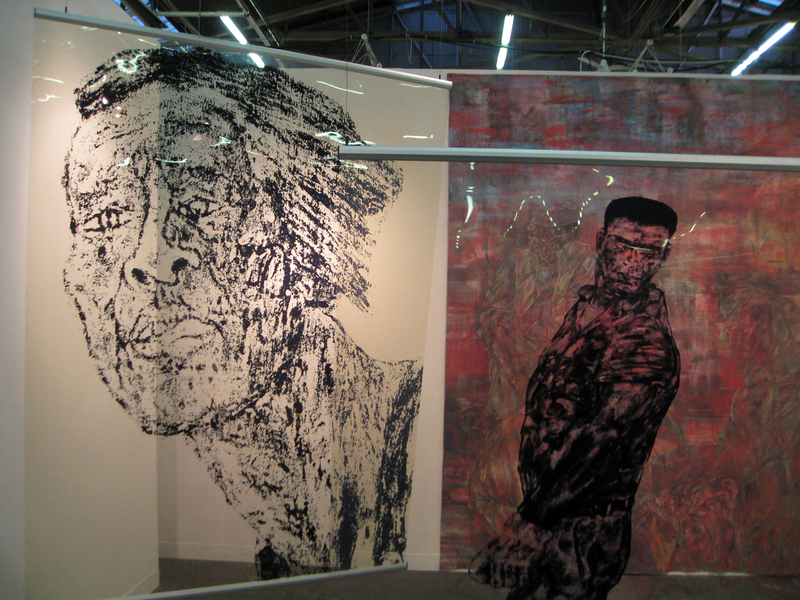 NEW YORK—The biggest news in art this week was the Armory Show at Piers 92 and 94 and when the New York Times featured a photograph 30 Osama bin Laden busts by Wang Du with its coverage, photocopies of the story became a part of the Chinese artist’s installation at Galerie Laurent Godin. 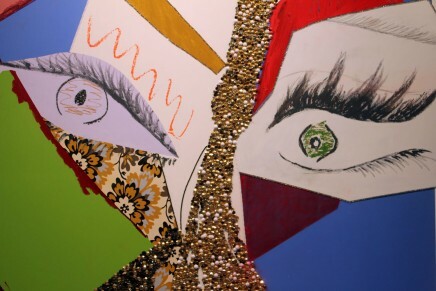 Du’s conceptual work is driven by current events and the busts of the late leader of the terrorist organization Al Queda were inspired by an article in a French newspaper. 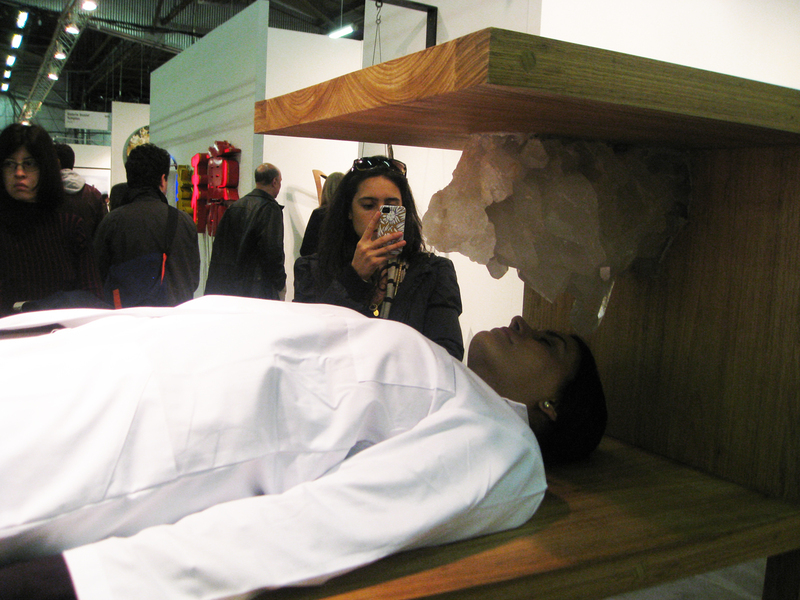 When the Armory Show opened to the public, articles from both publications were strewn among the provocative work. 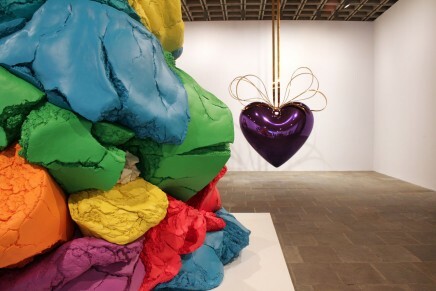 The Armory Show bills itself as “the most adventurous and dynamic contemporary art show in New York” and this year more than 200 art galleries participated in the event that drives Armory week, an opportunity to explore a range of art fairs hosted in the city. 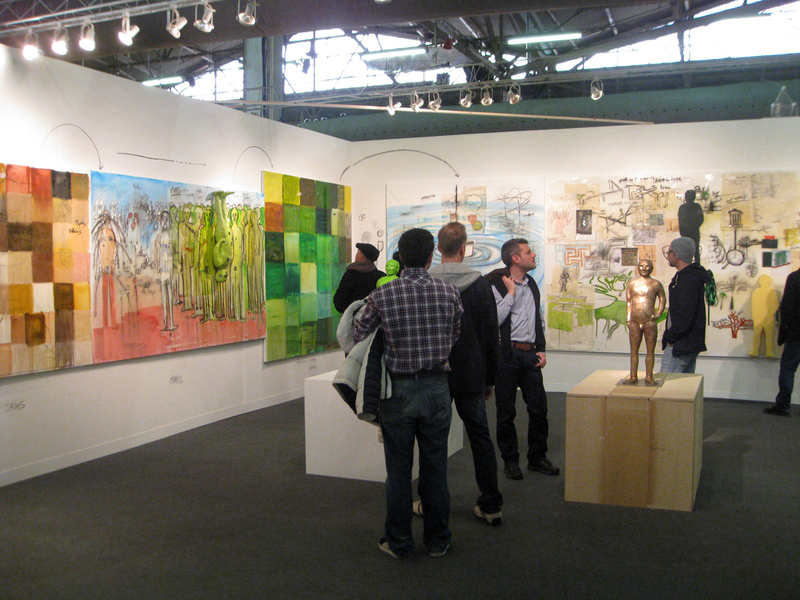 Pier 92 showcases modern art and contemporary art, the primary Armory draw, is at Pier 94. This year, the crowd was huge, and in addition to the bin Ladens, there was a woman sleeping on a platform with a crystal formation about to pierce her face. Today was the last day of the show which ran from March 8 to March 11, 2011. Read Part 2 on the show. Above, Performance art at Luciana Brito Galeria. 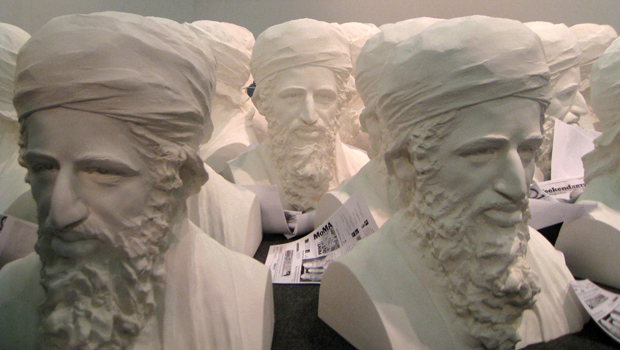 Top of page, “Image Absolute (plaster busts) by Wang Du at Galerie Laurent Godin of Paris. 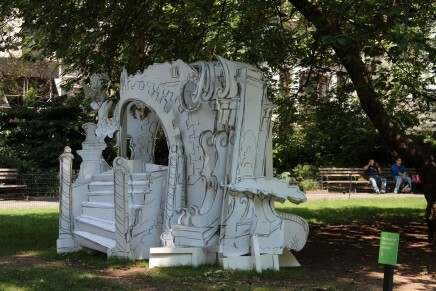 Installation by Fabrice Hyber at Galerie Jerome de Noirmont. 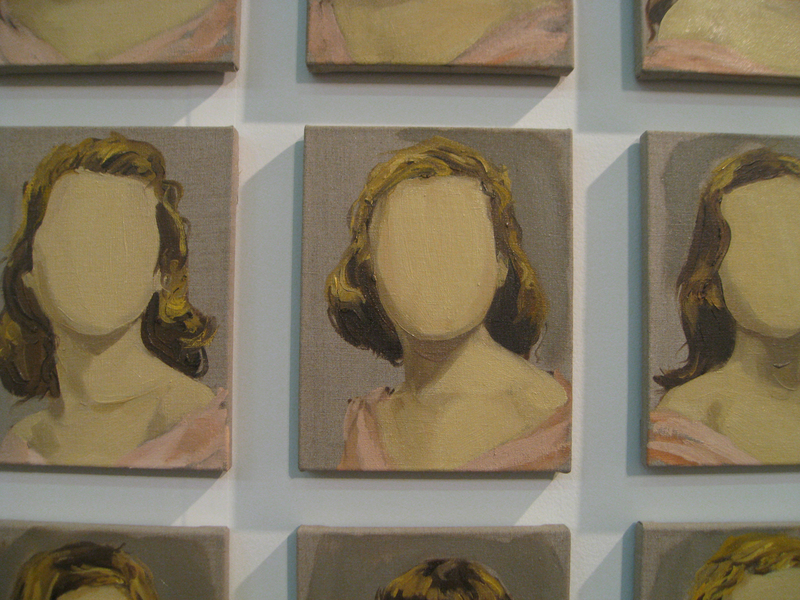 Detail of “Class of 1947 (Prom),” 2012, (oil on linen) by Gideon Rubin at Rokeby of London. 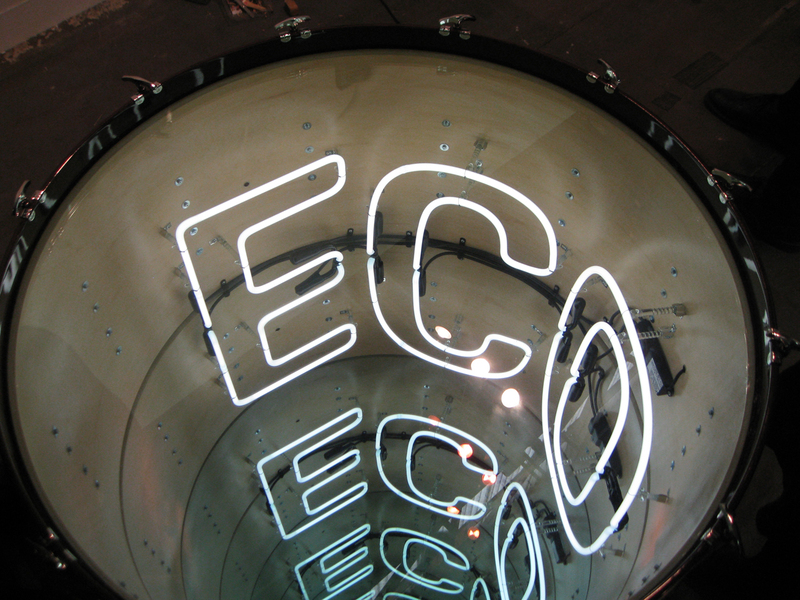 Drum with Neon light and mirror creates infinity effect, by Ivan Navarro at Baro Galeria. At left, “The Arrest 2” 1992 (on transparency) by the late Leon Golub at Ronald Feldman Fine Arts. 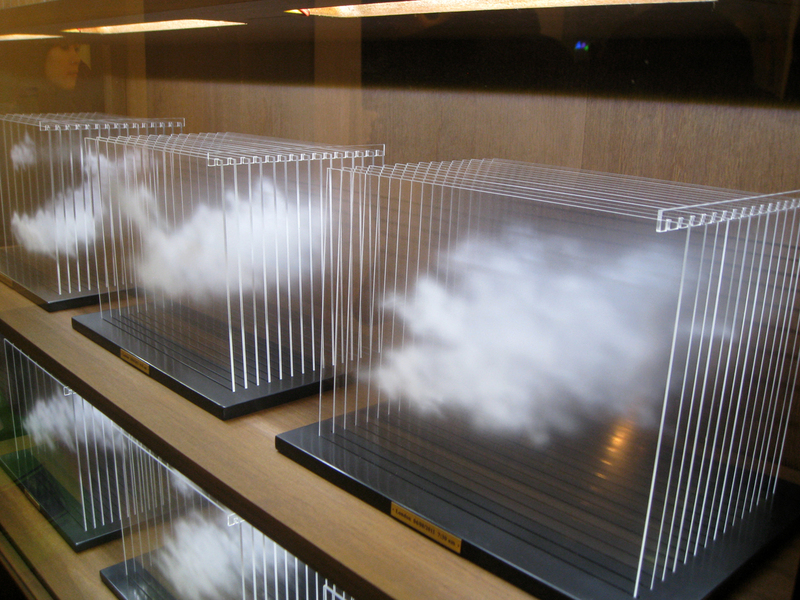 Detail of “La Vitrina Cloud Collection (London),” 2011 (wood, glass, acrylic and solid surface) by Leandro Erlich at Sean Kelly Gallery. 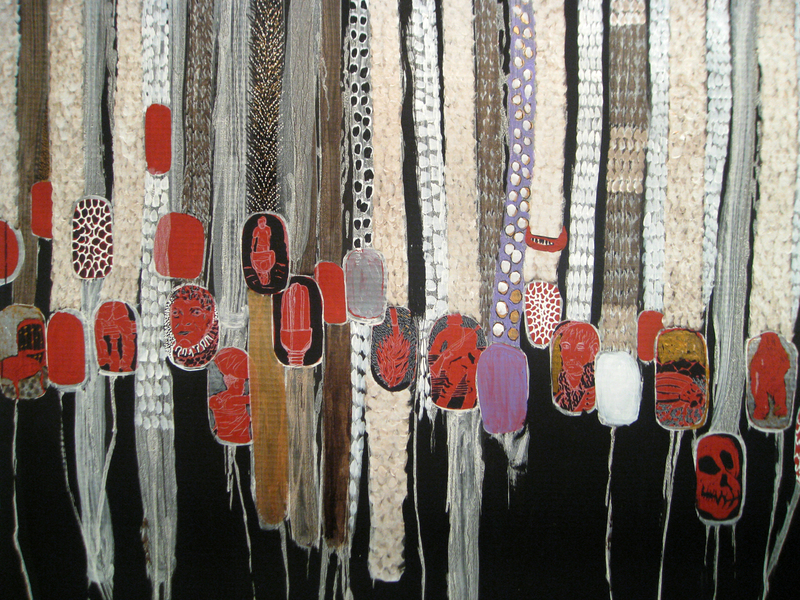 Painting by Omar Ba at Galerie Anne de Villepoix. 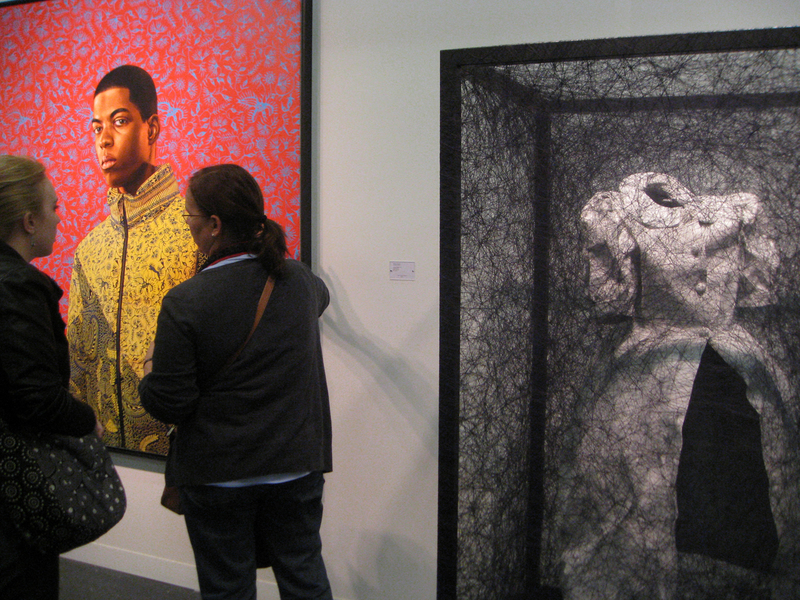 From left, “Anthony Metellus” 2011 (oil on canvas) by Kehinde Wiley and “State of Being (Children’s Dress),” 2012 (dress, painting, metal and threads) by Chiharu Shiota, at Galerie Daniel Templon. 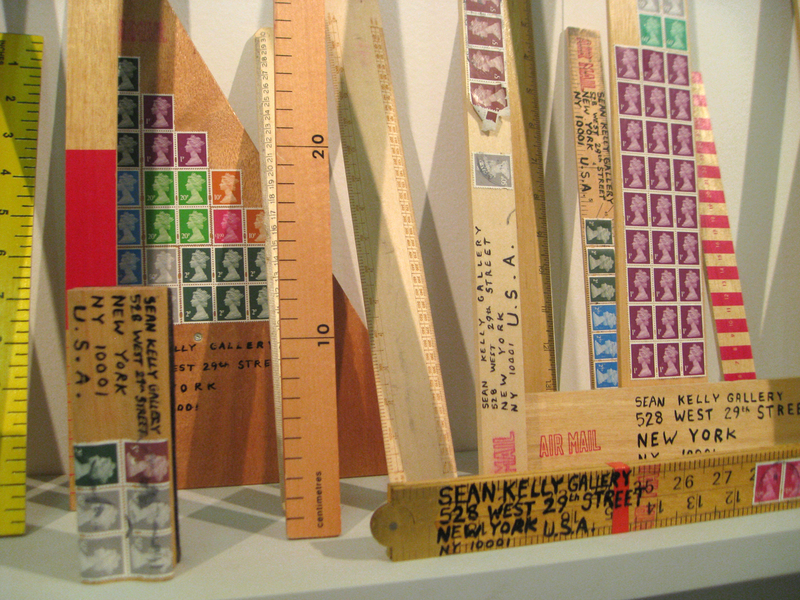 “Wooden Mail Objects,” 2011 (wood and stamps) by Peter Liversidge at Sean Kelly Gallery. 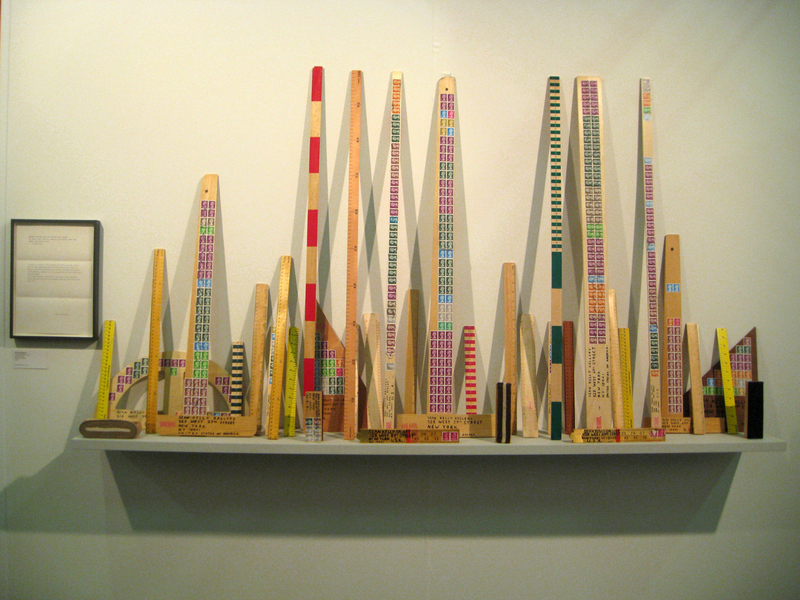 Detail of “Wooden Mail Object.” The installation includes the artist’s letter to the gallery proposing the installation for the Armory Show. 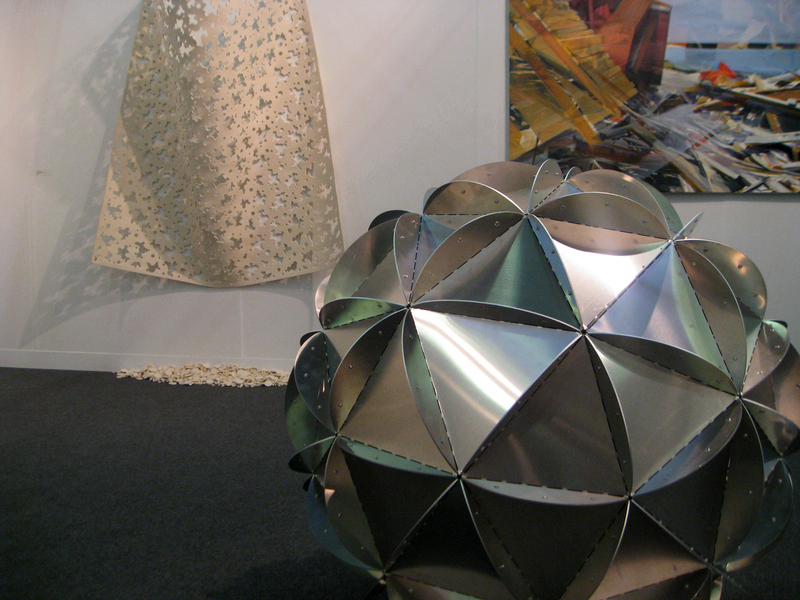 At right, “Pluton est une planete,” 2006 (aluminum) by Les Freres Chapuisat; Background, at left, “Area de Trabaja,” 2010 (industrial felt) by Ricardo Rendon at JGM. Galerie.